On Sunday August 14th join us from 12:00 pm to 3:30 pm for the 9th annual Landscape Conservation Workshop at the Evans Family Garden. 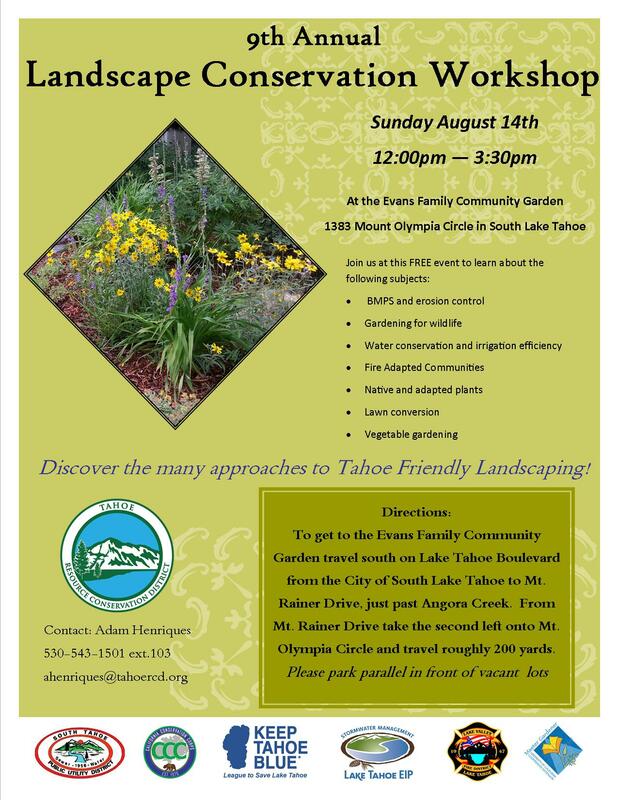 The garden is located at 1383 Mount Olympia Circle in South Lake Tahoe. To get to the Evans Family Garden from South Lake Tahoe travel south on Lake Tahoe Boulevard from the “Wye” to Mt. Ranier Drive, just past the Angora Creek Bridge, and take your second left onto Mt. Olympia Circle. SIgns will be posted from Lake Tahoe Boulevard . 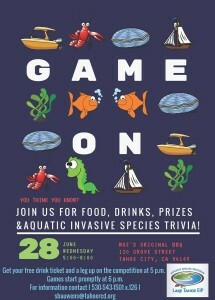 Come join and join us for a night of hands-on activities and presentations about the past, present, and future of aquatic invasive species control and prevention efforts. This year’s annual public forum will be held from 5:30pm – 7:30pm at the Tahoe Center for Environmental Sciences in Incline Village which hosts a variety of hands on exhibits such as: an invasive species station filled with various invasive species and a timeline of introduction, including a fish tank displays with live native and invasive fish species. Step onto the boat exhibit and learn about the secchi disk and how it is used to describe Lake clarity, or take a tour of the hands-on information about Lake Tahoe and its history. Enjoy refreshments as you tour the interactive booths and learn about the numerous actions and ongoing Science that is being done to protect Lake Tahoe while the kids take part in an invasive scavenger hunt. 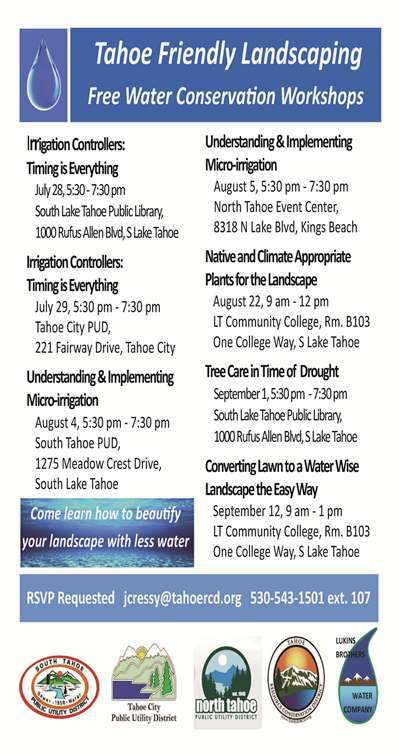 Presentations will give participants information about Eyes on the Lake and invasive weed identification, control projects planned for 2016 and beyond, as well as a presentation from the Tahoe Keys Property Owners Association about their role in tackling invasive species (see schedule below). 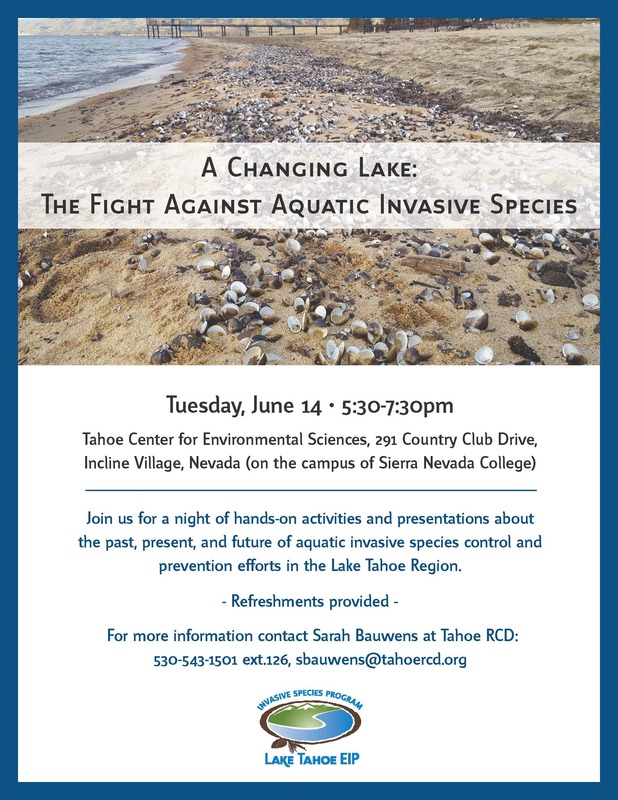 For more information or to RSVP contact Sarah Bauwens 530-543-1501 ext.126 or sbauwens@tahoercd.org.